This article is about the assault armor from Halo 3. Were you looking for the assault armor from Halo: Reach? The Assault harness is an armor set of the Sangheili, and features a dynamic recharging energy shielding. It is a reissued pre-Covenant Sangheili harness that features reinforced aligned composites and buttress principal protective stratum to preserve structural coherence of underlying tissue, and ultra resilient deltoid protection to aid in the concussive shock force and direct kinetic energy. Much like the standard combat harness, it is also designed to be intimidating and damage the enemy's psyche and morale. The armor was restricted from use when the Sangheili joined the Covenant, due to its startling effectiveness, and remained in use only in limited quantity. The restriction was abandoned when the Great Schism started. The Assault harness shares a distant origin with some variants of the Ranger harness, though both are now different armor systems. Description: "Reissue of the pre-Covenant assault class combat harness; reinforced aligned composites buttress principal protective stratum to preserve structural coherence of underlying tissues." The helmet is completely sealed unlike the combat harness and its main feature is a rounded plate around their forehead and head. It then features a pair of orange goggle like lenses. Both mandibles are protected by an angular guard and features a neck ring to the back with a pair of lights on each side. Unlike most other Sangheili armors, this helmet only has two mandible guards instead of four separate ones. The helmet also has metal plates along the Sangheili's neck. Description: "Ultra-resilient deltoid protection aid in dispersal of concussive shock force as well as direct kinetic energy transfer; reinforces image of Sangheili physical/martial superiority." The shoulder pauldron is squared off with a simple set of shapes and rectangle plate with a roughly triangular form on each side. 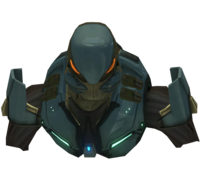 Due to the fact that they are square and feature a "trim" (the triangular plates), they are arguably more similar to Halo 2-era Sangheili Shoulders than Combat models are. Description: "With the dawn of this new age, assault-class combat harnesses will once again be issued to our forces after having been denied for so long by the illegitimate treaty imposed upon us by our ancient enemies." The thoracic cage of the Assault harness is nearly identical to that of the standard combat harness. The differences include a pair of clasps on each shoulder and a hexagonal piece armor set on the center of the chest. The Assault harness is the only Sangheili armor variant unlocked by default in the multiplayer of Halo 3—besides the default Combat harness. In the Halo 3 co-op campaign, the fourth player controls Usze 'Taham, a Sangheili wearing the Assault harness. Rtas 'Vadum wears the shoulder and body pieces of this armor permutation with the helmet of a Combat variant during the events of Halo 3. In the Halo 3 level Floodgate, some Sangheili corpses have an Assault helmet, but due to a glitch, the Combat helmets are on them as well, making a combination helmet. These corpses only appear toward the end of level in the crashed Flood ship. In concept art released for The Package, the Assault harness was incorrectly labeled as the Flight harness. A Sangheili with the Assault harness in Halo 3. Render of the Assault harness as worn by Usze 'Taham. Usze 'Taham clad in Assault armor. Another view of Usze 'Taham in Assault armor. A Sangheili in silver Assault armor on Sandtrap. A glitched Assault and Combat helmet together found on the Halo 3 level Floodgate.